Dakota’s makes fundraising fast, easy and fun! 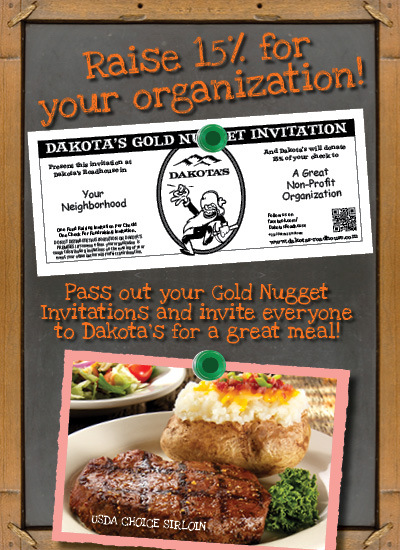 Just invite your family and friends to Dakota’s for dinner on a pre-scheduled evening, and we’ll donate 15% of your group’s total sales to your non-profit organization. Ask the Manager on duty for a copy of our Gold Rush Application or download and print the form below. Complete our application form – don’t forget your Tax ID number! Return the completed form to your neighborhood Dakota’s. Up to 500 Customized Gold Nugget Invitations. Great food and friendly service in a fun atmosphere! A donation equal to 15% of the sales on checks accompanied by your organization’s Customized Gold Nugget Invitations on your scheduled evening.